The webs of funnel weaver spiders are a recognizable site in many homes, gardens and landscapes of Ohio, though the spider is often unseen, concealed within the funnel, out of sight. Funnel webs are produced by a variety of spider groups across North America. By far the most commonly encountered in Ohio are the true funnel weavers in the family Agelenidae. Other common Ohio spiders that make funnel webs include the hackledmesh weavers in the family Amaurobiidae, which also produce funnel-shaped retreats at the base of their “bedraggled and unkempt” webs. The funnel of both groups serves as shelter from the elements, protection during mating or feeding, and also for protecting egg sacs and spiderlings. As with most spiders, the shy owners of these webs provide valuable pest management services as generalist predators of other arthropods in the landscape or home. By feeding on potential pest species, these spiders can contribute to the overall health of a landscape as part of the natural enemy complex causing a reduction in pest populations. Funnel weaver spider hiding in the narrowed funnel of its web. Photo credit: © Bryan E. Reynolds. 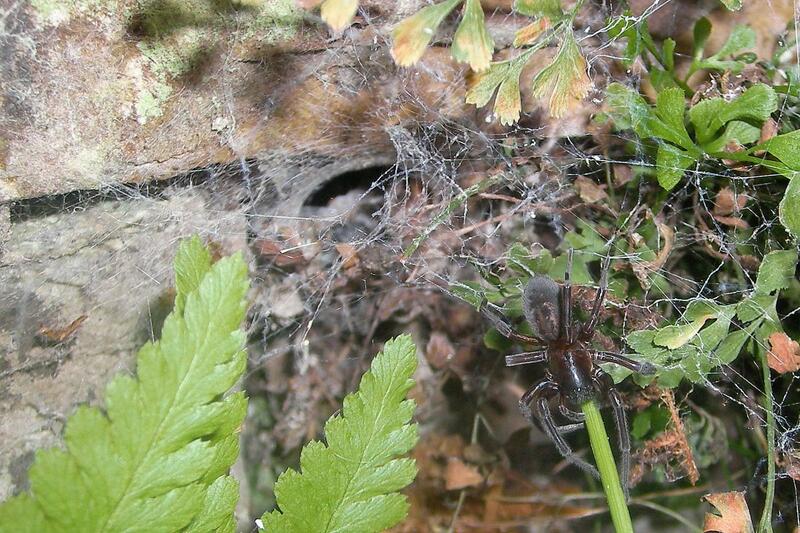 Hackledmesh weavers produce messier webs than the sheet-like funnel webs of Agelenidae. Photo credit: Danny Steaven, Wikipedia Commons CC by 1.0. Like all arachnids, funnel weaver spiders have a two-segmented body: the head, or cephalothorax (prosoma), and an abdomen (opisthosoma). They have eight legs (four pair), distinguishing them from their six-legged insect relatives. Spiders have one pair of appendages known as pedipalps near the chelicerae (mouthparts), which assist in prey capture and manipulation, are utilized in mating, and generally serve as a sensory appendage. 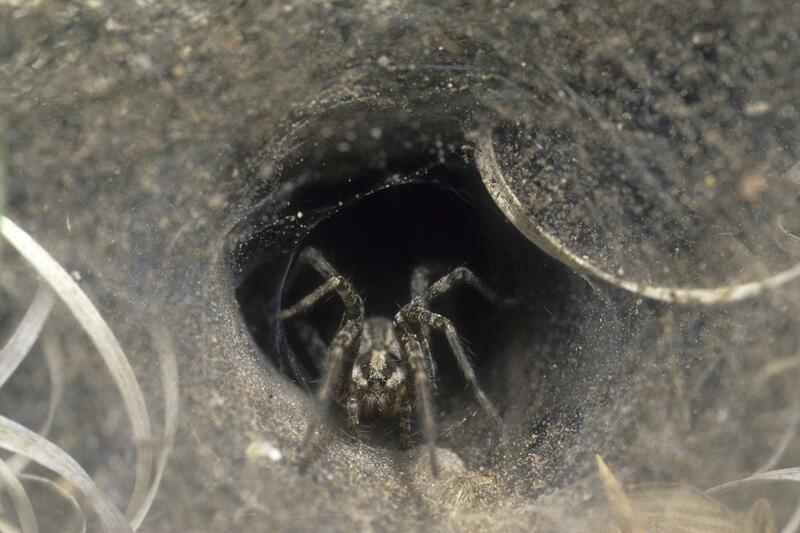 A funnel-weaver is most easily identified by its web, which is constructed of a flat sheet of webbing that narrows into a funnel or tube shape in the back. The funnel often bottlenecks into a shrub, denser grass, hollow crevices, or into the corners of a structure. If the spider itself can be identified, it’s by the elongated spinnerets that protrude beyond the end of the abdomen in most, but not all, species. These should be apparent when looking down from above the spider. The abdomen most often tapers to a point, whereas wolf spiders, which are often confused with wandering funnel weavers, tend to have more rounded abdomens. While color is not always the best way to identify a spider, funnel weavers are often mottled brownish or greyish with longitudinal stripes on both the abdomen and cephalothorax. 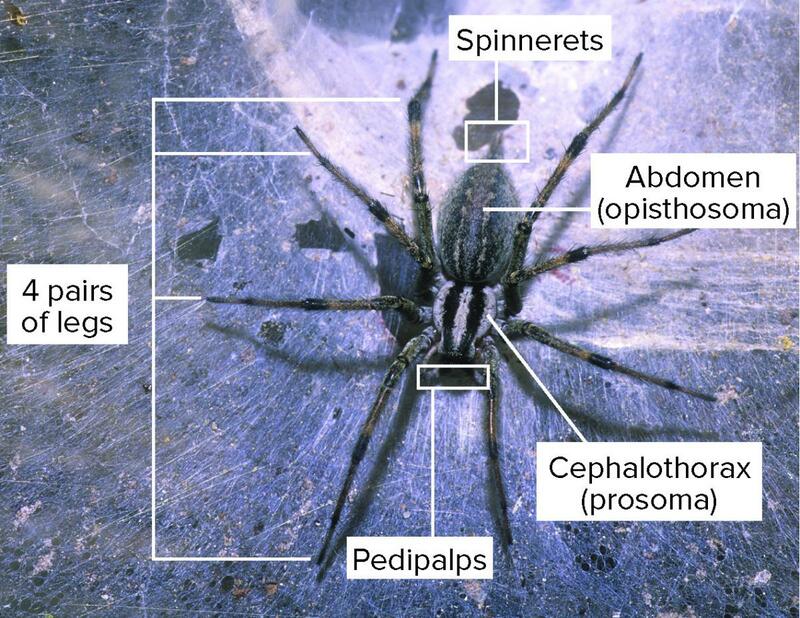 There are approximately 111 species of Agelenidae in North America, 13 of which have been documented in Ohio. Funnel weaver spiders often have distinctly visible spinnerets at the tip of their abdomen. Note also the two longitudinal stripes along the cephalothorax and more faintly on the abdomen. Photo credit: © Bryan E. Reynolds. 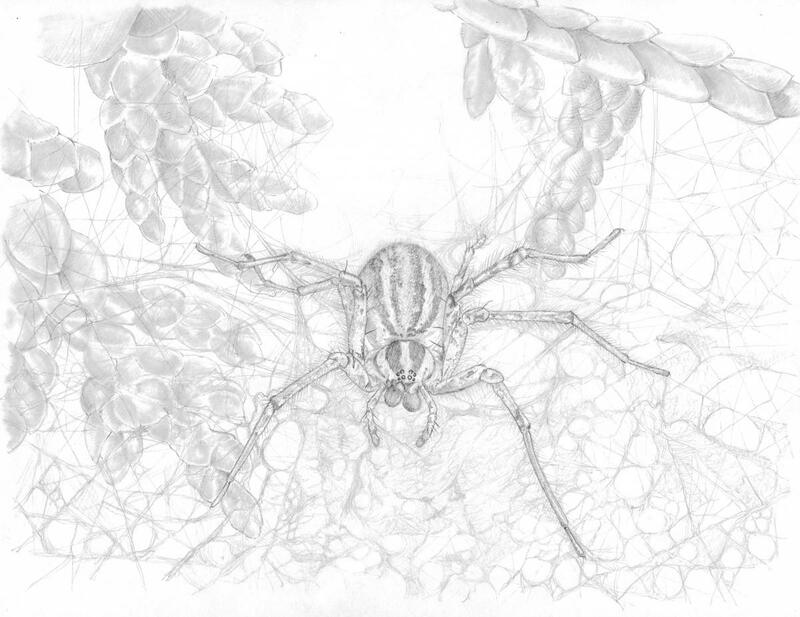 Illustration of funnel weaver spider on web emphasizing the distinctive lateral stripes down prosoma and abdomen. Image Credit: Rachel Shoop. Funnel weavers are not active predators, preferring to “sit-and-wait” in their funnel for unsuspecting prey to be intercepted by the web. The funnel weaver often lays “intercept” webbing above their primary web. These threads are meant to knock flying insects into the sheet web below. In most cases, funnel weaver webbing is not sticky. Rather, the spider relies on lightning fast speed to quickly dart from its funneled-hiding place to capture its prey. Spiders bite and paralyze their prey and often drag it back into the safety of the funnel to consume it. Funnel weavers are generally active at night, but will collect prey whenever it triggers the web. Many funnels also have a rear exit that serves as an escape when the web is disturbed by a predator or curious human. Female funnel weavers lay eggs that are spun with silk into an egg sac within their web, which hatch into tiny spiderlings that molt several times as they mature. This process of shedding the outer protective layer as they grow is termed gradual metamorphosis, which refers to gradual increase in size without change in form. Mature males seek females to mate, generally in autumn in Ohio, when they sometimes wander into homes. Grass spiders are funnel weavers in the genus Agelenopsis that are commonly found in grass or shrubs and hedges. 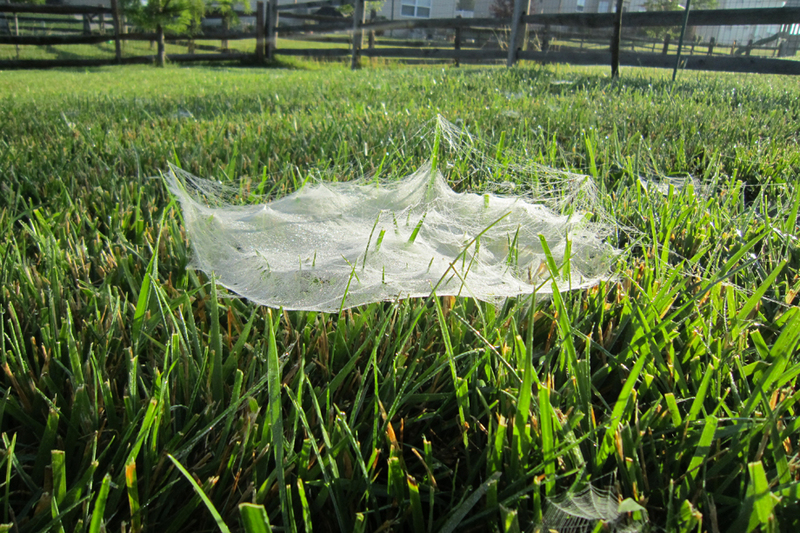 Dewy mornings often reveal a vast network of sparkling grass spider webs strewn across the lawn. One of the most common grass spiders for Ohio is Agelenopsis pennsylvanica. They are tan with two dark brown stripes on the cephalothorax, breaking up into mottling or spots on the abdomen. They mature in late summer and begin mating in autumn. Females of A. pennsylvanica then lay eggs under bark or debris near the ground and stays with the egg sac until she is killed by the first hard frost. Grass spider webs can be found in lawns and shrubs. They are most noticeable in the early mornings covered with dew. Image Credit: Joe Boggs. The webs of the house funnel weaver, also known as barn funnel weaver, Tegenaria domestica, are commonly found in basements, barns, sheds, and other structures in Ohio. These spiders are medium to large and are light brown to tan with two dark lines down its back beginning at the eyes. There is also often a thin dark line between these two larger lines on the head region. Most notable is a light, “chevron” patterning down the abdomen. This is one funnel weaver whose spinnerets are not exaggerated, and thus may not be visible beyond the abdomen as in other species. This species inhabits human structures where it can survive indoors for years protected from the elements. Bradley, R. 2013. Common Spiders of North America. University of California Press. Berkeley, CA. 271 pages. Bradley, R. 2004. In Ohio’s Backyard: Spiders. Ohio Biological Survey. 185 pages. Gardiner, M.M. 2015. Good Garden Bugs. Quarry Books. Beverly, Massachusetts. 176 pages.